In a social studies lesson at primary school, I remember learning that the staple food of Australians was bread. That was the forerunner to learning about growing wheat and grinding it to make flour. I wonder if bread is still considered to be our staple food? To the extent that the bookends that hold in the fillings for the American-style hamburgers and chickenburgers that seem to be our contemporary cuisine are made from bread, I suppose that it is possible. If we accept that bread was at least an important food item in Brisbane, then it stands to reason that we would need mills to produce it. 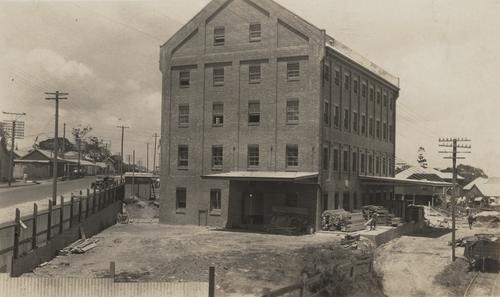 An early mill was built and operated by convicts on Wickham Terrace, and pictured above just after its construction in 1930 is another one, this time in the near northern suburb of Albion. It was built by Stuart Brothers for £8,500. The mill building was originally five storeys, and was later expanded. The photo below shows the current form of the building and you can see the different brickwork resulting from the addition of another floor as well as sort of bolt-on extensions at the front and side. The blog woolly days says that White Wings self-raising flour was produced here from 1957, and the grain silos in the picture below were erected in the sixties. The mill later was bought by and produced Defiance flour. Well, as you can see from the signs in the recent pictures, the site is to be redeveloped into... you guessed it - apartments. But there is a difference here. This will be a Transit Oriented Development (TOD); one that integrates medium- to high-density living with commerce, as well as a bicycle station and railway station. The Albion railway station is right next door to the old mill, and will be included in the revamped complex. 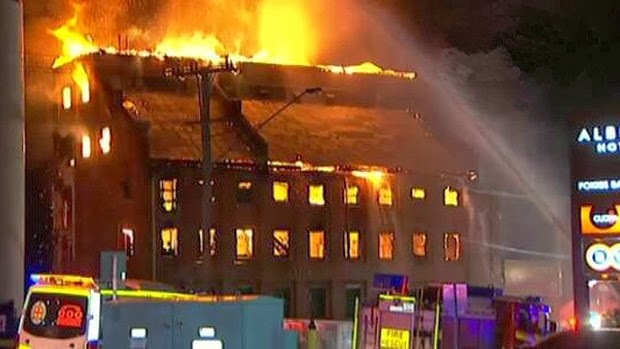 EDIT: I am saddened to add that a deliberately-lit fire consumed this building in the early hours of 27 November 2013. The damage was so severe that the structure has been demolished for safety reasons. One of the things I liked about catching the train to the city as a kid was the smell as you stopped at Albion Station. I'll be interested to see how it's redeveloped. No more flour milling unfortunately - let's hope that there will be other attractions! See the SLQ blog http://blogs.slq.qld.gov.au/jol/2013/12/19/edward-hudson-and-family-of-albion/ It fills out the picture.